Melville, NY, September 29, 2017 –(PR.com)– Eclipse WiFi Corp., a global leader in WiFi solutions, has just launched their Quick Network Case, a means of quickly connecting entities back to the rest of the world. The QuickNetCase® is a complete wired and wireless network solution built into a waterproof Pelican Storm Case™ that will run off 12VDC or 120VAC. 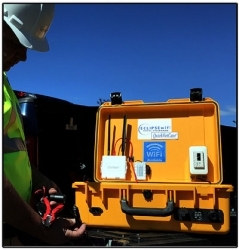 “Our QuickNetCase® automatically connects to a cellular network, and then provides a wired connection as well as a WiFi hotspot directly from the case. The amount of bandwidth to each WiFi user is then controlled through our network appliance and different bandwidth limits can be set through login codes. The case can be powered through multiple available power options including a 12V battery, 120 VAC, or 220VAC power. Additionally, a solar and 12V wind turbine options are available,” explained Don Davis, President of Eclipse WiFi Corp.
“I have owned property down in the Caribbean since 1998 and have been to many of the islands affected by the hurricane several times per year for work as well as for pleasure. To see the extent of the damage the islands received is very upsetting and my heart goes out to those affected by the hurricane. I wanted to do something to help in the efforts and knowing our QuickNetCase® would help regain some form of basic communications, we moved the release of our new QuickNetCase® up from our planned November release.” The QuickNetCase® is available to all those affected by the recent Hurricanes such as hotel and resort owners, business owners, rescue entities, local and state governments, relief effort teams (such as the American Red Cross) and any other entity that requires an Internet connection. “In speaking with entities on the various islands, just getting basic communications back would mean so much to them and would help in the rebuilding and recovery efforts,” Davis noted. Headquartered in Melville, NY, Eclipse WiFi Corp. is one of the leading providers of turnkey wireless solutions to hospitality, retail, and education, as well as federal, state, and local governments. The company has been providing wireless solutions to its customer base since 1991. For more information on this press release or the company, contact Don Davis at 631.465.2110, fax 631.794.2400, email [email protected], or visit http://www.eclipsewifi.com.